Wall painting fragments with a representation of a wild boar hunt. From the later Tiryns palace. National Archaeological Museum, Athens. An analysis of ancient DNA has revealed that Ancient Minoans and Mycenaens were genetically similar with both peoples descending from early Neolithic farmers. They likely migrated from Anatolia to Greece and Crete thousands of years prior to the Bronze Age. Modern Greeks, in turn, are largely descendants of the Mycenaeans, the study found. The discovery of the Minoan and Mycenaean civilizations on the island of Crete and on mainland Greece in the late 1800s gave birth to modern archaeology and opened a direct window into the European Bronze Age. This period of history had previously been glimpsed only though Homer’s epics, the Iliad and Odyssey. 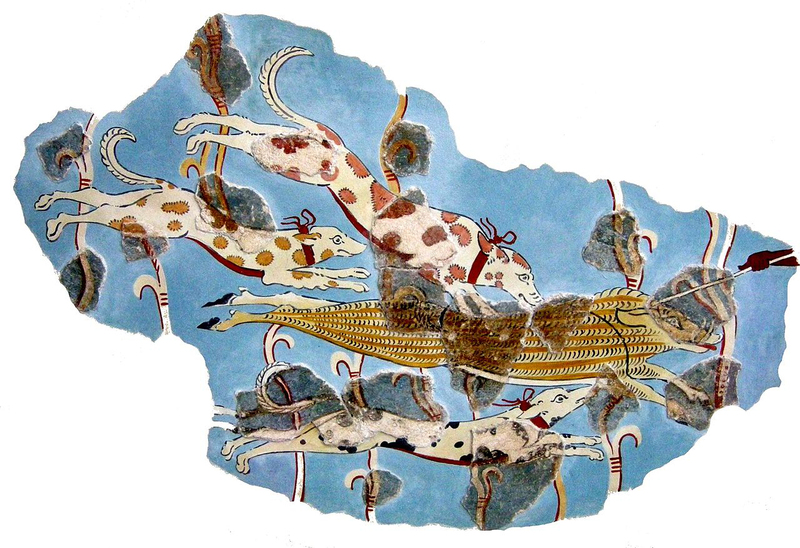 The Minoan civilization flourished on Crete beginning in the third millennium before the Common Era and was astonishingly advanced artistically and technologically. The Minoans were also the first literate people of Europe. The Mycenaean civilization developed in mainland Greece in the second millennium before the Common Era. It shared many cultural features with the Minoans. They used the Linear B script, an early form of Greek. The origins of the Minoan and Mycenaean peoples, however, have puzzled archaeologists for over 100 years. It is widely believed that they derived from different ancestral populations. A new analysis of well-preserved Minoan and Mycenaean DNA now provides many answers and insights. An international team of researchers from the University of Washington, the Harvard Medical School and the Max Planck Institute for the Science of Human History, together with archaeologists and other collaborators in Greece and Turkey, report the first genome-wide DNA sequence data on the Bronze Age inhabitants of mainland Greece, Crete, and southwestern Anatolia. UW Medicine researcher, George Stamatoyannopoulos, professor of genome sciences and of medicine at the University of Washington School of Medicine, is the senior author on the paper describing the new findings. The study appeared August 2 in the advanced online edition o the journal Nature. The researchers analyzed tooth DNA from the remains of 19 ancient individuals who could be definitively identified by archaeological evidence as Minoans of Crete, Mycenaeans of mainland Greece, and people who lived in southwestern Anatolia. The DNA samples were collected by Stamatoyannopoulos and his archaeologist collaborators, and were initially analyzed in his laboratory. Subsequently, Stamatoyannopoulos began collaborating with Johannes Krause of the Max Planck Institute, who undertook comprehensive genomic DNA sequencing using techniques developed in his laboratory, and P David Reich of Harvard Medical School, who worked with Iosif Lazaridis on collation and statistical genetic analysis of the data. The compared the Minoan and Mycenaean genomes to each other and to more than 330 other ancient genomes and over 2,600 genomes of present-day humans from around the world. Study results show that Minoans and Mycenaeans were genetically highly similar – but not identical – and that modern Greeks descend from these populations. The Minoans and Mycenaeans descended mainly from early Neolithic farmers, likely migrating thousands of years prior to the Bronze Age from Anatolia, in what is today modern Turkey. “Minoans, Mycenaeans, and modern Greeks also had some ancestry related to the ancient people of the Caucasus, Armenia, and Iran. This finding suggests that some migration occurred in the Aegean and southwestern Anatolia from further east after the time of the earliest farmers,” said Lazaridis. While both Minoans and Mycenaeans had both “first farmer” and “eastern” genetic origins, Mycenaeans traced an additional minor component of their ancestry to ancient inhabitants of Eastern Europe and northern Eurasia. This type of so-called Ancient North Eurasian ancestry is one of the three ancestral populations of present-day Europeans, and is also found in modern Greeks. While the new study does not resolve all the outstanding questions, it provides key answers. Importantly, the findings disprove the widely held theory that the Mycenaeans were a foreign population in the Aegean and were not related to the Minoans. The results also dispel the theory that modern Greeks did not descend from the Mycenaeans and later ancient Greek populations. In broad strokes, the new study shows that there was genetic continuity in the Aegean from the time of the first farmers to present-day Greece, but not in isolation. The peoples of the Greek mainland had some admixture with Ancient North Eurasians and peoples of the Eastern European steppe both before and after the time of the Minoans and Mycenaeans, which may provide the missing link between Greek speakers and their linguistic relatives elsewhere in Europe and Asia. The study thus underscores the power of analysis of ancient DNA to solve vexing historical problems, and sets the stage for many future studies that promise to untangle the threads of history, archaeology, and language.